Well, Legoland Malaysia isn't located in Tioman of course, but as you will see below, Legoland and Tioman do make a great combination. Legoland Malaysia is jam-packed with all kinds of LegoLand family fun. In fact, LegoLand Malaysia offers no fewer than 40+ awesome rides, spectacular shows and exciting attractions that your wide-eyed littl'uns will be talking about again and again. Our activities are not only fully immersive but entertaining, inspiring and hands-on too, so kids can play, learn, try, use, invent, ride, solve and even splish-splash to their heart's content. Click here to book your Legoland Malaysia tickets now - safely and securely. You can book any bus journey in Malaysia and Singapore. No booking fee. And if all this isn't enough, your little engineers-in-the-making will also have plenty of opportunities to let their imagination soar by creating, building and developing their elaborate Lego productions in our many Lego brick-themed experiment centres. From our Lego play-corners to our Lego rollercoasters, Legoland Malaysia is a veritable journey of educational discovery and unlimited fun for the entire family. Our Pièce de résistance is Lego Miniland, a unique must-see collection of countless famous Asian landmarks recreated, Lego brick by Lego brick, to a scale of 1:20. Our entire Lego Miniland now stands at an unbelievable grand total of more than 30 million Lego bricks! Lego Miniland is a breathtaking interactive mini-world where everything: people, trains and airplanes, move around in their own little Lego world at a simple push of a button. Legoland Malaysia is located in Nusajaya, in the state of Johor, so regardless of whether you're travelling by plane, train, bus or car, Legoland Malaysia is always easy to find and easy to reach. 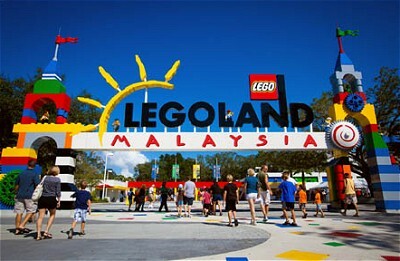 And best of all, LegoLand Malaysia is just a hop and skip away from Paradise Island Pulau Tioman. So now you can follow up your thrill-a-minute Friday Legoland visit with a round-the-clock weekend of lounging by the pool or snorkeling in our crystal-clear sea. The ultimate long weekend for the young and the young-at-heart. - From Danga Bay, proceed straight via the Coastal Highway > Proceed all the way to Nusajaya > You'll see Legoland Malaysia before reaching Kota Iskandar. Enjoy your LegoLand Malaysia/Tioman weekend!